Just two examples of skateboard guitars, custom hand made guitars made from the decks of recycled skateboards. well what is more cool than a guitar? We were therefore really interested to find out about Prisma Guitars a company that are making pretty cool looking guitars from recycled skateboards. San Francisco based Prisma Guitars was founded by Nick Pourfard, a 22 year old industrial design student, who is also a keen musician and skateboarder. He decided to put together his two passions and so the concept of skateboard guitars was born. 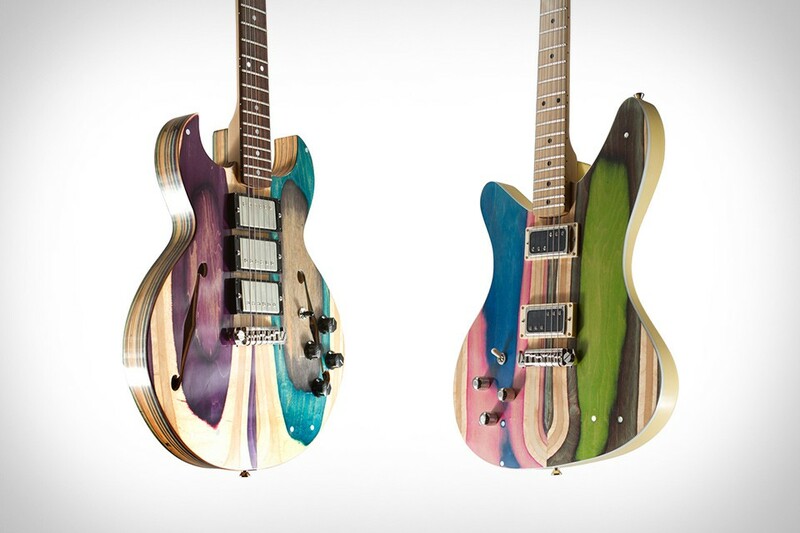 Pourfard takes old skateboard decks and recycles them into some truly amazing looking guitars. As he says people think, wrongly as it turns out, that skateboard decks are made from plywood. They are actually made from at least 7 pieces of hard rock maple glued to form a laminate which provides great strength and flexibility. Some of the pieces of maple will be dyed giving a wide range of colours. When Pourfard combines these elements in the guitar body and neck you get a truly amazing looking guitar. As these are custom hand-made guitars where, because of the construction technique, no two guitars will look the same the price tag matches the designer quality. However, these are amazing guitars and so are well worth taking a look at, if nothing else we can admire and dribble over the cool design. To find out more about skateboard guitars check out the video below or go to the Prisma Guitars website. Grab The Yamaha FX370C Electro Acoustic Guitar it’s a gem!